The Monte Conero, a rocky mount falling sheer to the sea, is just a 15-minutes drive north from Porto Recanati. The Parco Naturale del Conero (Conero Natural Park), a protected area that stretches over 5800 hectares, is definitely the place to go for a long walk or a Mountain Bike ride fully immersed in nature, and then, perhaps, go down to the beautiful beach of San Michele and have a refreshing swim..
A hill town bordering Porto Recanati, Loreto is known for being the seat of the Basilica della Santa Casa, one of the most important and ancient sites of Marian pilgrimage in the Catholic world. It houses, in fact, the statue of the Black Madonna, also known as Vergine Lauretana. Among the popes who have visited the basilica there is Pope John XXIII, Pope John Paul II and Pope Benedict XVI. 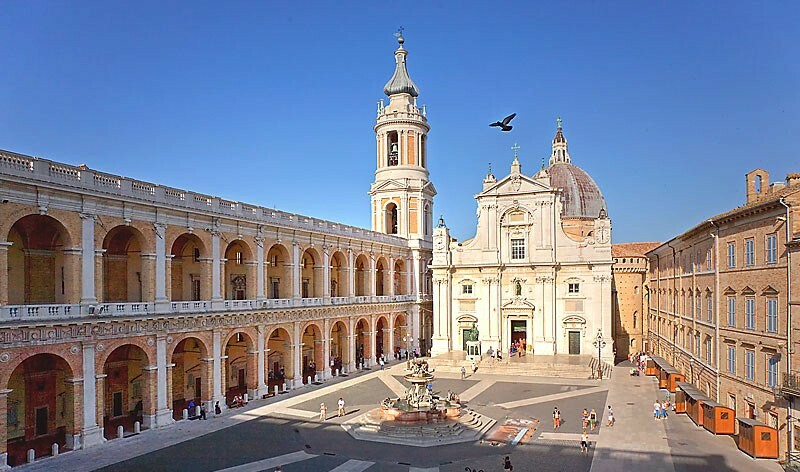 The Basilica of Loreto is one of the most important monuments of the italian Gothic-Renaissance architecture, the realization of which contributed the greatest architects of that time: Marino di Marco Cedrino, Baccio Pontelli, Giuliano da Sangallo, Giuliano da Maiano, Francesco di Giorgio Martini, Bramante, Andrea Sansovino and Antonio da Sangallo the Younger. Some frescoes were also made by Lorenzo Lotto. 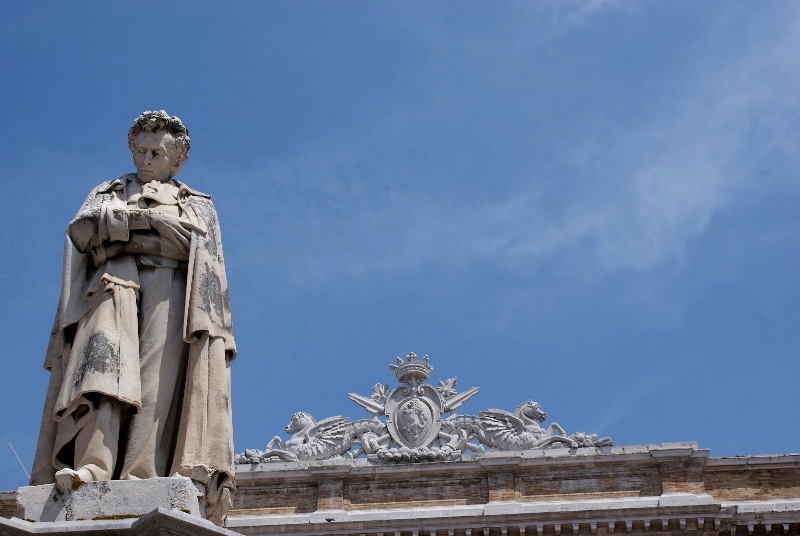 Recanati is the hometown of Giacomo Leopardi, who is considered to be the greatest italian poet of the 19th century. Palazzo Leopardi is the birthplace of the poet, and is now inhabited by the descendants and open to the public. Among the areas that is possible to visit, especially valuable is undoubtedly the library, which preserves more than 20,000 volumes collected by the poet’s father, Monaldo. The Colle dell’Infinito (Hill of Infinity) is the summit of the Tabor mount, which overlooks the vast landscape that inspired Leopardi’s masterpiece “L’infinito”, composed when the poet was 21 years old. Inside the park stands the World Center of Poetry and Culture, a venue for conferences, seminars, and cultural events. In the autumn of 2013 it was shot in Recanati “Il giovane favoloso” by Mario Martone, a film based on the life of Giacomo Leopardi starring the famous italian actor Elio Germano as the protagonist. With a capacity of about 2800 seats, the Sferisterio Arena of Macerata is the second outdoor arena in Italy after the one in Verona. Designed in 1823 by the neoclassical architect Ireneo Aleandri, the structure was originally dedicated to a very popular sport at that time in Italy, called Pallone col Bracciale. 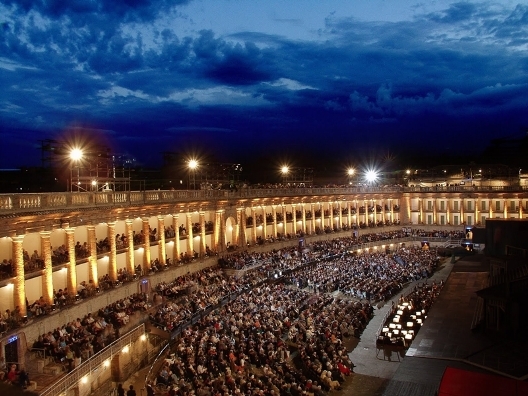 Every summer, musical events of national relevance take place at Sferisterio, the most important of which are undoubtedly the Macerata Opera Festival and Musicultura. The Macerata Opera Festival brings to the stage Opera performances with the best artists of the international scene and of the highest possible quality, focusing each year on a different theme that binds the different works. Musicultura is a festival of Italian folk singers and emerging bands, with prestigious national and international guests. The Grotte di Frasassi are underground caves located in the municipality of Genga (AN), about an hour’s drive from Porto Recanati. The caves complex falls within the Regional Natural Park of Gola della Rossa and Frasassi. Inside these karstic caves it is possible to see lots of natural sculptures formed by layers of limestone over 190 million years, thanks to the work of water and rock. Since 1974 some parts of the caves are open to public, and have become, over the years, one of the major tourist attractions of Le Marche. It is estimated that, since then, over 12 million people have visited them. For those interested in shopping, just a 20-minutes drive from Porto Recanati is one of the famous footwear districts of Le Marche, around the areas of Civitanova and Porto Sant’Elpidio. Here are the factory’s outlets of many world renowed brands, including: Cesare Paciotti, Loriblu, Fornarina and, going a bit more inland, Tod’s and Prada outlet.